Facebook have launched an interesting page where they collect stories from their users about what Facebook means to them. Called Facebook Stories, it’s not a new feature or anything, it’s more like an online messageboard. 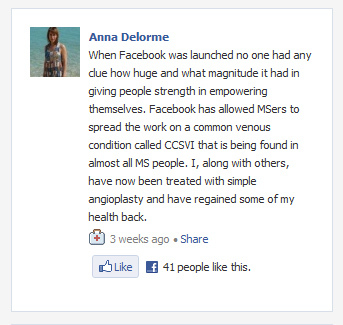 Given that Facebook has 500million active users, anything they do is big news and will get load of interaction. And it looks like this has. The Facebook Stories page is an interesting mine of stories from Generation Social – the age group whose Facebook friends are their real friends. Lots of stories are about reconnecting with friends and finding the love of their lives.. “FB suggested her through recommended friends”; “I started messaging him and now we’re married”… But there are 30 categories of stories and it’s fascinating to go into ones like “Military” or “Peace” or even “University” or “Small Business”. Check out two Peace ones below… pretty inspiring eh? But it’s also interesting that there are so many stories from older generations about Facebook too… I guess for them, the arrival of Facebook was something that actually changed their lives, instead of being the wallpaper of their lives. 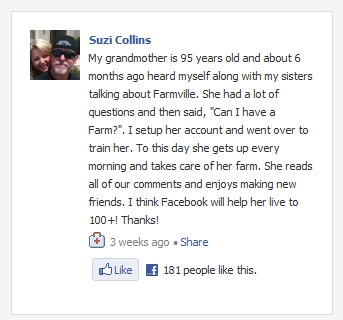 I particularly like this one about the 99 year old playing Farmville. A mine of data when the history of the 21st century comes to be written.